Diaper Discussions: Confessions of a "Newbie"
I'm mama to 2 precious boys (5/08 and 1/11). So excited to be CD'ing a newborn with all the great options in newborn diapers! And CD'ing a toddler is no piece of cake! We hope to share our adventures with you and some of the things we learn along the way! It is my hope that this Blog provides support for those cloth diapering their babes or for those interested in making the switch! Please feel free to contact me through my Contact Form if you have any questions! Thanks! Mama to 3 crazy kids and owner of She Thinks Media. She's been cloth diapering since 2007 and is known as the Cloth Diaper Geek! Contributed by Miracle- our newest employee! When I first discovered I was pregnant with my oldest son in 2007, I immediately began thinking about the best way to birth him and feed him. Like any pregnant or new mother, you research the best options for your child, from car seats and cribs, to daycares and pediatricians. For me, breastfeeding was a given, as was attempting the most natural and intervention free birth possible. For some reason, it never occurred to me to think about using cloth diapers as part of a more “natural parenting” lifestyle. Diapering was hardly a blip on my radar! As he grew older, I discovered multiple problems with using disposables. He would break out into a rash, they always seemed to leak (up the back blowouts anyone? ), they were expensive and smelly, we ran out constantly, and it felt as though my trash was always overflowing. I also started thinking more the environmental impact of these diapers…where do they end up when they are used? A landfill? What resources are being used to make them? What exactly are in these things? All of these questions continued to follow me through the course of my son’s baby and toddlerhood, but I did not have adequate information, support, or resources to make a decision at that time. 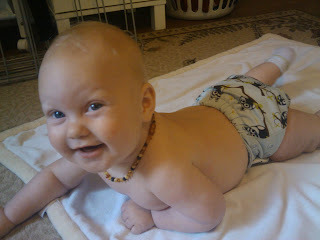 When I discovered I was once again pregnant with baby #2, I made a firm decision to research cloth diapering. What I found was definitely surprising. The variety, ease of use, and flat out cuteness of cloth diapering was amazing. I knew this time I would be able to have success with cloth, I just needed someone to inform and encourage me. With the help of my sister and several people at the store, I was able to stock different types of diapers and covers. Since the birth of my second son, I have not only had success with diapering, but I have grown to love cloth and trying out and collecting different diapers. My husband teases me whenever I come home with new diapers! One of the best moments I have had with cloth diapering is my grandmother telling me how proud of me she is for using cloth. If cloth was good enough for her, it is good enough for me! considering, give it a try! Wanna bring your friends to have a Fluffy Chat with us? Just grab this code and add it to your blog! Thanks!